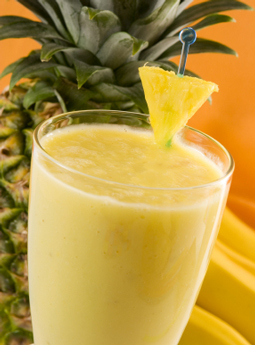 Tropical Fruit Smoothie - A recipe from Savor California, the online showcase for extraordinary gourmet foods and beverages from California. This quick and easy pineapple, banana and dried plum smoothie packs no fat, yet offers tons of flavor–perfect for breakfast on the go! In blender container, combine all ingredients except ice cubes. Add ice cubes. Blend until smooth, pulsing on and off.